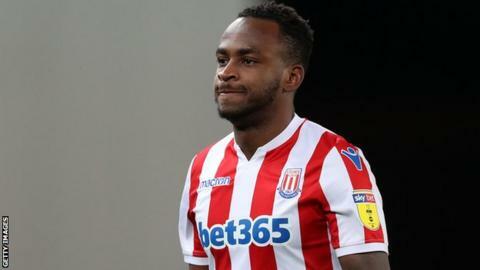 Stoke City's Saido Berahino has been named in Burundi's squad for their 2019 Africa Cup of Nations qualifier against Gabon. It is Burundi's final qualifier for Egypt 2019 and will take place on 23 March in Bujumbura. The Swallows are currently second in Group C on nine points, two behind Mali who have already qualified. Burundi just need a draw against Gabon to reach their first ever Africa Cup of Nations finals. Berahino scored against Gabon in the away leg last September to give Burundi a 1-1 draw on his international debut. The former England under-21 international had only been cleared to play for Burundi a month before that fixture. Elsewhere, Swallows coach Olivier Niyungeko has also included Belgium-born teenager Mohamed Amissi who receives his first senior international call-up. 18-year-old Amissi, who plays for the youth team of Dutch club NAC Breda, is among an entirely 25-man foreign based squad and is rewarded for a strong performance during last month's Africa Under-20 Nations Cup in Niger. Scotland-based midfielder Gael Bigirimana and striker Abdoul Fiston who plays for Algeria's JS Kabile are also included.